Pontos Requerido: 12550 Os jogos não são compatíveis com dispositivos móveis e tablets. Por favor adicione este título à sua Lista de Desejos e inicie a sessão na sua conta the first club desde um computador para concluir o processo de solicitação. NOTICE: Activation key must be used on a valid Steam account, requires internet connection. 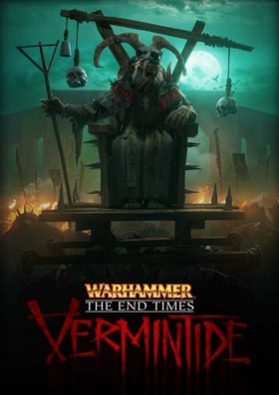 ABOUT THE GAME	Vermintide is an epic co-operative action combat adventure set in the End Times of the iconic Warhammer Fantasy universe.Vermintide takes place in and around Ubersreik, a city overrun by Skaven, a race of relentless rat-men. You will assume the role of one of five heroes, each featuring… different play-styles, abilities, gear and personality. Working cooperatively, you must use the heroes’ individual attributes to survive an apocalyptic invasion from hordes of Skaven. Battles will take place across a range of environments stretching from the top of the Magnus Tower to the bowels of the Under Empire. The time of mortals is ending, and the reign of Chaos draws ever closer. The Dark Gods are at last united in a singular purpose, spreading their madness across the world as never before. In the Empire of Sigmar, Karl Franz's gaze is focused on the incursion of the savage northmen, but it is not the only threat. As the Chaos moon Morrslieb waxes full, shrill voices echo through tunnels gnawed far beneath the Empire's cities, and a Skaven host swarms towards the surface. It emerges first in the city of Ubersreik, a hideous, screeching mass that consumes everything before it. Soon Ubersreik is a charnel-town, drowning beneath the malevolent shadow of the Horned Rat.Yet even in the darkest times, there are always champions to light the way. As Ubersreik cowers, five heroes, united by capricious fate, carry the fight to the rat-men. It remains to be seen whether they have the strength to survive, let alone work together long enough to thwart the invaders. One truth, however, is beyond all doubt: should these five fall, Ubersreik will fall with them. KEY FEATURES	The Collector’s Edition of Warhammer: End Times - Vermintide comes with: Ubersreik Map - A high resolution digital copy of the Ubersreik Map, detailing the town and its treacherous streets. Vermintide Wallpapers - High resolution wallpapers to decorate your screen and prepare you for the battles to come. Behind the Scenes Pack - This pack contains documents, concepts and footage stretching back to the beginning of Vermintide’s development. The Official Soundtrack - The atmospheric tones of a soundtrack written to match the malicious Skaven race, by critically acclaimed composer Jesper Kyd. UNIQUE Headpiece: Candlelight Guard - A Guard for the Bright Wizard that is adorned with beeswax candles from Altdorf's most exclusive chandler. Beeswax candles burns cleanly without the foul and terrible odour of their cheaper tallow counterparts. UNIQUE Headpiece: Dal Grimazul - From the Dark Lands to Marienburg, the shape of the Dal Grimazul helm is instantly recognizable. This is the classic Dwarf War Helm, proven over millennia of battle and hardship, and a favourite of Bardin the Ranger. UNIQUE Headpiece: Hat of Purifying Light - With two candles blessed by Priests of the Great Temple attached to the band of his wide brimmed hat, a purifying glow surrounds the Witch Hunter as he strides forth in the night. “The righteous feel no pain. Be you unrighteous?” - Victor Saltzpyre. UNIQUE Headpiece: Tal Amere Crown - A battle hood from the Hall of Tal Amere in Atylwyth, the winter realm of Athel Loren. Its delicate fabric keeps the wearer warm and safe, useful for Kerillian as she walks the often cold and hostile land of men. UNIQUE Headpiece: Ironside Helmet - A helmet for the Soldier, named after the ‘Ironsides’, a unit whose recruits are drawn from the guards and apprentices of the renowned Imperial Gunnery School. Clad in heavy armour and armed with master-wrought firearms, the Nuln Ironsides are one of the most widely respected and well equipped Handgunner regiments in the Empire. 2 UNIQUE Trinkets - Dazzle the rest of your team with these 2 prestigious trinkets. SYSTEM REQUIREMENTS MINIMUM: OS: Windows 7 64-bit, Windows 8/8.1 64-bit, Windows 10 64-bit* Processor: Intel Core2 Quad Q9500 @ 2.83GHz or AMD Phenom II X4 940 Memory: 6 GB RAM Graphics: NVIDIA GeForce GTX 460 or AMD Radeon HD 5770 /w 1GB VRAM DirectX: Version 11 Network: Broadband Internet connection Storage: 30 GB available space Additional Notes: *WARNING: 32-bit OS is NOT officially supported at this time RECOMMENDED: OS: Windows 7 64-bit, Windows 8/8.1 64-bit, Windows 10 64-bit* Processor: Intel Core i7-4790K @ 4.00 GHz or AMD FX-9590 @ 4.7 GHz Memory: 8 GB RAM Graphics: NVIDIA GeForce GTX 780 or AMD GPU Radeon R9 290 DirectX: Version 11 Network: Broadband Internet connection Storage: 30 GB available space Additional Notes: *WARNING: 32-bit OS is NOT officially supported at this time Warhammer End Times: Vermintide © Copyright Games Workshop Limited 2015. Warhammer End Times: Vermintide, the Warhammer End Times: Vermintide logo, GW, Games Workshop, Warhammer, The Game of Fantasy Battles, the twin-tailed comet logo, and all associated logos, illustrations, images, names, creatures, races, vehicles, locations, weapons, characters, and the distinctive likeness thereof, are either ® or TM, and/or ©Games Workshop Limited, variably registered around the world, and used under license.